Mark Rocha was born and raised in the South Bronx by two parents who never completed high school. His earliest memories are of his father studying at the kitchen table every night after a long day at work. Mark’s father used his Korea GI Bill Benefits to attend night school for eight years at Columbia University. "I'm for the little guy," Dr. Rocha says. "My parents started without anything but they saw to it I went to college. The American Dream is my life story. The American Dream is alive and well and resides today in our community colleges." 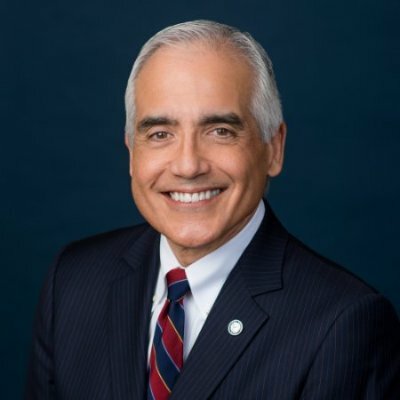 After retiring as superintendent-president of Pasadena City College in 2010, Mark was called back to his hometown of New York to work in the Governor’s Office of Sandy Recovery where he helped to rebuild over 3,000 homes damaged by the hurricane. This encore career provided Mark with the opportunity to develop as a leader in the private sector, as well as to earn an engineering degree from the University of Alabama, Birmingham. Dr. Rocha has lived his life as a lifetime learner. Dr. Rocha came to Pasadena City College in 2010 from the Los Angeles Community College District where he served as president of West Los Angeles College. While he was president, WLAC was recognized by the Chronicle of Higher Education as one of the nation's "Great Colleges to Work For." An English teacher by training, Dr. Rocha received his Ph.D. in English from the University of Southern California, his master's degree from California State University, Fullerton, and his bachelor's degree from Villanova University. His scholarly work is in the field of American drama and theater and includes numerous articles on the playwright August Wilson, whose best-known play, Fences, was recently made into an Academy Award-nominated movie. In 1994, Dr. Rocha was awarded a Fulbright Fellowship and taught for a year in Caracas, Venezuela at the Universidad Simòn Bolìvar. Mark and his wife, Nancy, herself a construction manager, live in Southern California. Dr. Rocha has two adult children; Brendan, an officer in the U.S. Navy, and Samuel, in college. An avid runner, Dr. Rocha has completed seven marathons. His knees and hips are still original equipment.